I agree as well based on the experience of others with the S5 based unit. While I've not tuned it myself, the better design of the S5 hot side and wastegate would support the positive experience of others. Bingo. And that's why it would be so much better if Brian would just document the issues on his website. Like being very clear that the turbo comes with a wussy wastegate actuator (even the "upgraded" actuator he sells, which my friend originally purchased, is a bloody 6 PSI spring) and boost issues may result. Yes, and that's my issue with the BNR hybrids as shipped. A wussy 6 PSI spring which is easily overpowered by backpressure, and then because of high backpressure, even a much higher PSI spring eventually being pushed away. If he had included a double diaphragm actuator or made it an option, this would be far less of an issue. One person's opinion on what is a bodge vs. another's will differ. I consider it completely dodgy and that the most correct mechanical solution is a double diaphragm actuator. Sadly it seems that the helper spring will remain on my friend's car for the time being because it basically works, and he can move onto other things rather than **** around with wastegates. The unfortunate part of the whole thing is that the "easy bolt on" turbo upgrade has become more of a hassle than a full upgrade would have been. 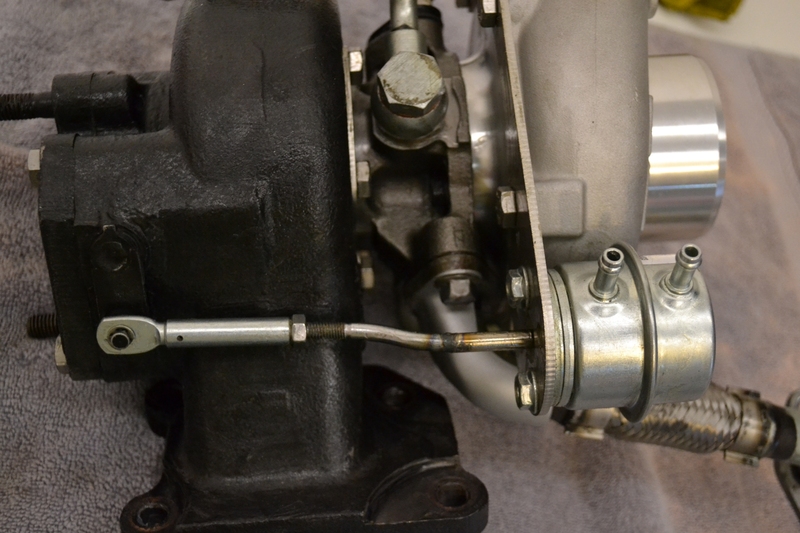 Time wise, we could have made a simple manifold for an internally gated 3076R. Same problem, even tho i asked for 12psi. How many lbs for the helper spring to achieve 12 or 15 psi? I don't recall the specs of the helper spring, unfortunately. We just tried springs until we found one that would do the job. While the spring works initially I'd suggest just getting a double diaphragm wastegate actuator or one designed for high pressure with a 12 PSI or so spring (ATP turbo carries them for under $100). These turbos need to be around 15 PSI to see their efficiency. Thanks a ton for your help and input. Going to heed your advice and try with the double diaphragm wastgate actuator. Been running but stage 3 with Profec b spec 2. No problem maintaining boost. Slightly lagging than stock turbo, but power gains were immense. For me, Bryan agreed to bolt up a Turbonetics dual port actuator (part 30326), which I sent him with my core. It required some welding because when he bent the rod, it snapped. The dual port actuator is letting me run an AMS-500 controller, which applies pressure to the opposing port. It is a stronger wastegate spring on-demand. Overall, it is working well, and I like the BNR. My boost curve still looks like this, with a distinct drop off. I am fighting the stock intake, AFM, snorkel, TMIC, and stock catback. I'm also using a TA-34 turbine, which might matter. Most folks get more than 7 PSI near redline. 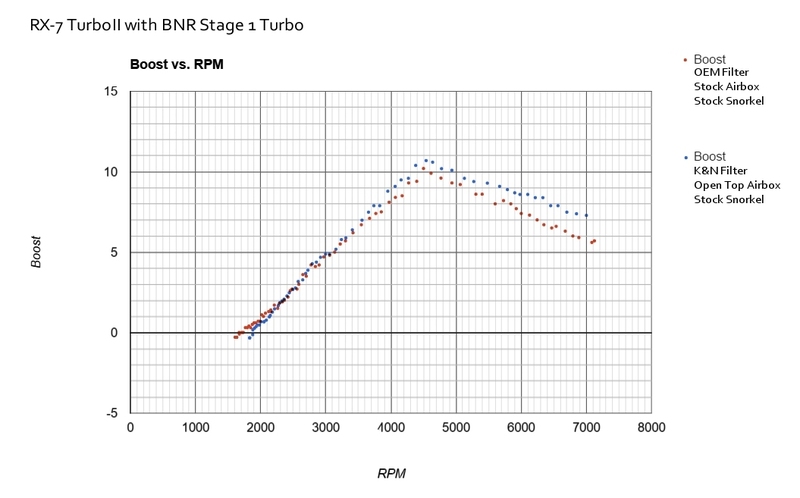 boost drop is common with these hybrids unless you add supporting mods to allow them to breathe, and they need alot of breathing room compared to properly balanced wheel size turbos. Passenger side wheel toed out.